$431.41 per month for 24 months. $2,931.47 due at lease signing. Excludes registration, tax, title and license. 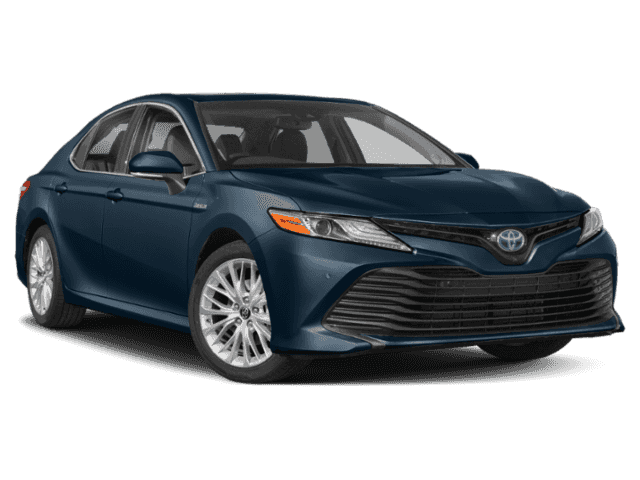 Offer Details Lease a new Camry Hybrid SE Model 2561: $431.41 / for 24 Months / with $2,931.47 DUE AT SIGNING. Amount due at signing includes DOWN PAYMENT of $2,500.06 and FIRST MONTHLY PAYMENT of $431.41. LEASE END PURCHASE OPTION is $19,551.72 plus tax, title and license. Customer is responsible for disposition, excess wear and tear fees and $.15 per mile over 12000 miles each year. Dealer participation may affect final negotiated price and applicable taxes. Monthly payment may vary depending on final price of vehicle and your qualifications. Must take delivery from dealer stock. Dealer sets final price. Offer valid 2019-04-02 through 2019-04-30. See dealer for vehicle and lease program details. Drivers should always be responsible for their own safe driving. Please always pay attention to your surroundings and drive safely. Depending on the conditions of roads, vehicles, and weather, etc., the system(s) may not work as intended. See Owners Manual for details. Security deposit required with exception of prior Toyota Financial Services (TFS) financing history and/or TFS tier rating in which a security deposit may be waived. $394.49 per month for 27 months. $2,958.65 due at lease signing. Excludes registration, tax, title and license. Offer Details Lease a new Camry Hybrid SE Model 2561: $394.49 / for 27 Months / with $2,958.65 DUE AT SIGNING. Amount due at signing includes DOWN PAYMENT of $2,564.16 and FIRST MONTHLY PAYMENT of $394.49. LEASE END PURCHASE OPTION is $19,231.20 plus tax, title and license. Customer is responsible for disposition, excess wear and tear fees and $.15 per mile over 12000 miles each year. Dealer participation may affect final negotiated price and applicable taxes. Monthly payment may vary depending on final price of vehicle and your qualifications. Must take delivery from dealer stock. Dealer sets final price. Offer valid 2019-04-02 through 2019-04-30. See dealer for vehicle and lease program details. Drivers should always be responsible for their own safe driving. Please always pay attention to your surroundings and drive safely. Depending on the conditions of roads, vehicles, and weather, etc., the system(s) may not work as intended. See Owners Manual for details. Security deposit required with exception of prior Toyota Financial Services (TFS) financing history and/or TFS tier rating in which a security deposit may be waived. $373.37 per month for 30 months. $3,065.74 due at lease signing. Excludes registration, tax, title and license. Offer Details Lease a new Camry Hybrid SE Model 2561: $373.37 / for 30 Months / with $3,065.74 DUE AT SIGNING. Amount due at signing includes DOWN PAYMENT of $2,692.37 and FIRST MONTHLY PAYMENT of $373.37. LEASE END PURCHASE OPTION is $18,590.16 plus tax, title and license. Customer is responsible for disposition, excess wear and tear fees and $.15 per mile over 12000 miles each year. Dealer participation may affect final negotiated price and applicable taxes. Monthly payment may vary depending on final price of vehicle and your qualifications. Must take delivery from dealer stock. Dealer sets final price. Offer valid 2019-04-02 through 2019-04-30. See dealer for vehicle and lease program details. Drivers should always be responsible for their own safe driving. Please always pay attention to your surroundings and drive safely. Depending on the conditions of roads, vehicles, and weather, etc., the system(s) may not work as intended. See Owners Manual for details. Security deposit required with exception of prior Toyota Financial Services (TFS) financing history and/or TFS tier rating in which a security deposit may be waived. $356.04 per month for 33 months. $3,176.62 due at lease signing. Excludes registration, tax, title and license. Offer Details Lease a new Camry Hybrid SE Model 2561: $356.04 / for 33 Months / with $3,176.62 DUE AT SIGNING. Amount due at signing includes DOWN PAYMENT of $2,820.58 and FIRST MONTHLY PAYMENT of $356.04. LEASE END PURCHASE OPTION is $17,949.12 plus tax, title and license. Customer is responsible for disposition, excess wear and tear fees and $.15 per mile over 12000 miles each year. Dealer participation may affect final negotiated price and applicable taxes. Monthly payment may vary depending on final price of vehicle and your qualifications. Must take delivery from dealer stock. Dealer sets final price. Offer valid 2019-04-02 through 2019-04-30. See dealer for vehicle and lease program details. Drivers should always be responsible for their own safe driving. Please always pay attention to your surroundings and drive safely. Depending on the conditions of roads, vehicles, and weather, etc., the system(s) may not work as intended. See Owners Manual for details. Security deposit required with exception of prior Toyota Financial Services (TFS) financing history and/or TFS tier rating in which a security deposit may be waived. $341.57 per month for 36 months. $3,290.35 due at lease signing. Excludes registration, tax, title and license. Offer Details Lease a new Camry Hybrid SE Model 2561: $341.57 / for 36 Months / with $3,290.35 DUE AT SIGNING. Amount due at signing includes DOWN PAYMENT of $2,948.78 and FIRST MONTHLY PAYMENT of $341.57. LEASE END PURCHASE OPTION is $17,308.08 plus tax, title and license. Customer is responsible for disposition, excess wear and tear fees and $.15 per mile over 12000 miles each year. Dealer participation may affect final negotiated price and applicable taxes. Monthly payment may vary depending on final price of vehicle and your qualifications. Must take delivery from dealer stock. Dealer sets final price. Offer valid 2019-04-02 through 2019-04-30. See dealer for vehicle and lease program details. Drivers should always be responsible for their own safe driving. Please always pay attention to your surroundings and drive safely. Depending on the conditions of roads, vehicles, and weather, etc., the system(s) may not work as intended. See Owners Manual for details. Security deposit required with exception of prior Toyota Financial Services (TFS) financing history and/or TFS tier rating in which a security deposit may be waived. Listed Incentives are available for registrations at Beaman Auto Group located in Nashville, TN. Information Provided by Automotive Information Systems, Inc: Information is Reliable but not guaranteed. Finance Offers (APR) are available to qualified buyers subject to Credit Approval, not all buyers will qualify.